The Korolev Crater is almost 51 miles wide and more than a mile deep — and full of ice that never melts. There’s no skating on Mars — not yet anyway — but a stunning new photograph of the Martian surface shows an ice-filled crater that looks a bit like a giant rink. The photograph — taken by the European Space Agency’s Mars Express spacecraft and released by the agency on Thursday — shows the Korolev Crater, a dish-shaped basin on the broad plain that surrounds the Martian north pole. The photo was stitched together from five images captured by a high-resolution camera aboard the uncrewed spacecraft, which has been circling the Red Planet for the past 15 years. Each of the five “strips” used to create the composite image was taken during a separate orbit. This image shows the landscape in and around the 50-mile-wide Korolev crater on Mars. The region outlined by the bold white box indicates the area imaged by the Mars Express orbiter on a series of orbits on April 4, 2018. The other white boxes indicate the data gathered by the orbiter over each individual orbit. The blue hues across the frame represent the elevation of the terrain, as indicated by the bar at the bottom. Mars has seasons just as Earth does, but the ice never melts because of the location of the crater and its topography. “This particular crater is very close to the polar ice cap, and the inside of the crater is at a lower elevation and more shadowed, so it creates a cold trap where the ice is stable,” Kirsten Siebach, a planetary geologist at Rice University in Houston, told NBC News MACH in an email. Siebach said it was unusual to see ice-filled craters on Mars. But if the Martian landscape is notoriously dusty and barren, the pockmarked planet holds quite a bit of water. 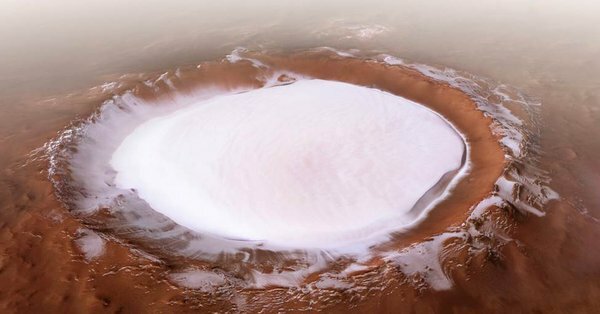 Just about all of it is frozen, although this year instruments aboard Mars Express revealed the existence of a large underground reservoir of liquid water near the planet’s south pole. Korolev Crater is named after Sergei Korolev (1907-1966), a rocket engineer who is considered one of the leading architects of the Soviet space program. Korolev was involved in the Sputnik program, which in 1957 put the first artificial satellite into Earth orbit, and worked on precursors to the Soyuz rockets that now carry crews to the International Space Station.